A massive historic building that was under renovation in Ypsilanti's Depot Town was gutted in an early morning fire that appears suspicious, city fire officials say. The cause of the blaze remains under investigation, but Ypsilanti Fire Inspector John Roe said it doesn't appear to be accidental. A damage estimate is not yet available this morning. No injuries were reported. Firefighters from several departments were at the scene for hours. The fire broke out at about 1:40 a.m. at the Thompson Block at northeast corner of Cross and River streets, across from the Sidetrack Bar and Grill in Depot Town. Firefighters said they were on the scene in minutes, but an exact response time was not available this morning. Flames were shooting from the building when crews arrived, and they called for help from firefighters in Ann Arbor, Ypsilanti Township, Pittsfield Township and Superior Township. 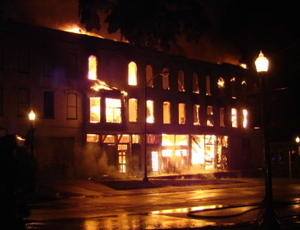 Ypsilanti fire officials said the building, which was being remodeled for lofts and retail space, was significantly damaged. Part of the building's roof collapsed, officials said. Fire inspectors have not yet been able to enter the building to assess the damage and investigate. They're awaiting approval from engineers to get inside the structure, officials said. The building, which had electricity running to it, was boarded up and locked, investigators said. Authorities received no reports of any suspicious activity in the area. The $3.5 million renovation project on the building started in 2006. Officials said all three floors were being renovated, and construction tools, plywood and other items were inside. According to the Ypsilanti building department, permits for work in the building expired April 29; no one was authorized to work on site after that date. Fire officials said they received reports that workers were in the building as recently as Friday; it's unclear whether they were working or the nature of any ongoing work in the building. Owner Stewart Beal told AnnArbor.com last month that he hoped to relaunch construction on the property and reopen his leasing office by Sept. 1. Beal acquired the building in May 2006 for $346,186; it's in a tax-free development zone. “This is a major, major fire in two-thirds of the building,” he said, describing the roof and interior destruction behind the wall that remains standing. Beal has at least 20 employees of his construction company on-site this morning, evaluating the condition and securing the property. “We’re analyzing (damage) and scrambling to make sure the rest of the building doesn’t fall,” Beal said. Beal declined to comment on the fire investigation or whether work was occurring on the property without the necessary permits. Ypsilanti City Council member Pete Murdock, who lives near the scene, called the blaze a setback for plans to revitalize the neighborhood. Murdock said he had hoped after the building was renovated, it would attract more people to Depot Town. Howard Bowen, 48, could see the fire as he was standing outside the Ypsilanti District Library's branch on Michigan Avenue about 1:45 a.m., he said. "I walked down and flames were shooting out the roof, out the windows," he said this morning. Mary Potts, owner of Potts Studio, a photography studio in Depot Town, said it's tragic that a fire broke out at the historic building, but it's fortunate the building was empty. "Hopefully, it is insured and will be taken care of," Potts said. 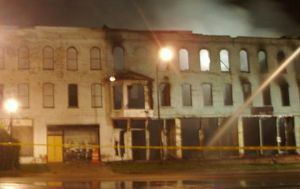 The fire appears to have started on the second floor of the vacant three-story building, said Ypsilanti City Fire Capt. Max Anthouard. AnnArbor.com's Paula Gardner and Amalie Nash contributed to this report. Firefighters used aerial trucks to pour water on the large blaze. Ypsilanti City Council member Pete Murdock took this photo of the fire this morning. A Superior Township Fire Department ladder truck sprays water into one of the windows of a warehouse on the corner of Cross and River Streets in Ypsilanti's Depot Town that caught fire early this morning.